To make artwork stand out in a room! Combine neutral toned art with a colorful interior as in this San Francisco loft. The black and white artwork, Street Scene, by Danish artist Gugger Petter pops amidst the reds, blues, golds and green, yet relates beautifully with the textured shag checkerboard carpet. Make artwork come alive! 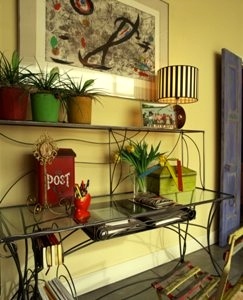 This Joan Miró lithograph, Trace #5, hanging above the custom made desk relates in feeling and movement to the desk. A powerful statement when teamed together. 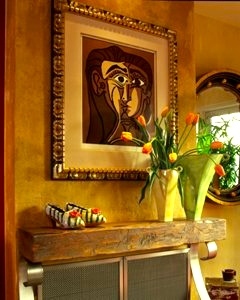 This linocut, White Eyes, by Pablo Picasso looks stunning over the fireplace surround. The pairing of the elegant Spanish gold leaf frame and rustic wood mantle offer an interesting juxtaposition while the colors in the wood and artwork sing to one another. 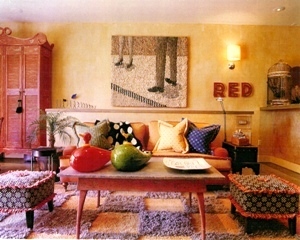 Linda Applewhite is an artist, writer, spokesperson and renowned interior designer based in San Francisco. Linda Applewhite has gotten to the core (pun intended) of the conundrum facing those who would optimize their art display. Thank you for sharing some of her imaginative/creative ideas. but, oh, what a dynamic combination! Ms Applewhite’s got the juxtapositioning genius gene. Thx for this interesting, informative blogpost, Kirby. Nice blog, but what do you do when you’ve run out of wall space! !